The weather is glorious today and we are eating outside. 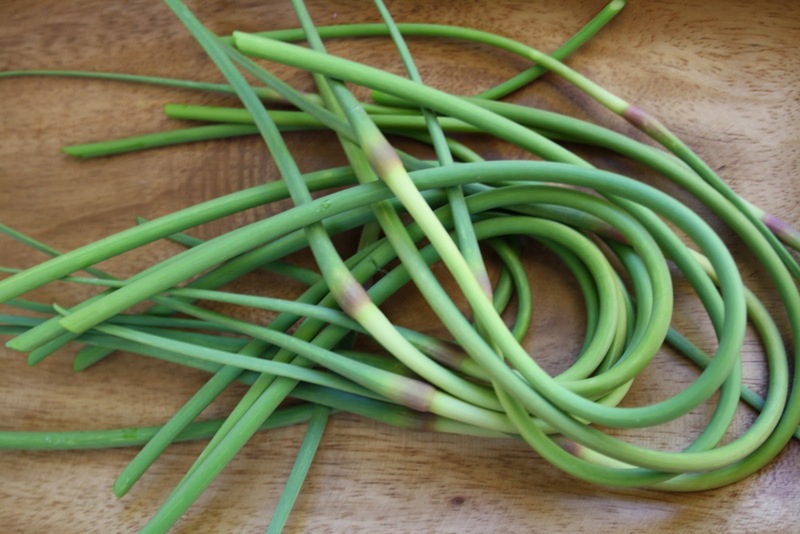 At the market today, the stall holder next door was selling garlic scapes, the young flower heads from garlic plants, which can be harvested early so that the bulbs will grow bigger. It not only reminded me that I have a bunch of these on my own plants, but also of this totally delicious post. Barbequed scape aoili (made from eggs and scapes from our garden) with greens and pink eyes from the market today. And a little bit of beef. With more of those beautiful strawberries for dessert. oooh we love those around here. We let them get a bit bigger and the kids call them "goblin tops"
We had goblin top soup over the weekend. Tonight we had a Sunday feast of fresh flake from Port Franklin with buttered almonds on top and broccoli and spurged on a Rockmellon. Isn't eating outside just wonderful. Your dinner puts ours to shame. It sounds delicious. It has also made me vow to do better tomorrow night. Yum Michelle! I was straight to the garden this morning to hunt for some of my own scapes. we just put together our brand new outdoor table...can't wait for the summer feasts to come. off to tend to the veggie patch as it too is a major part of that feasting. your dinner sounds super yum! These look a bit like porcupine quills or something! I imagine they were as tasty as they are delicious.